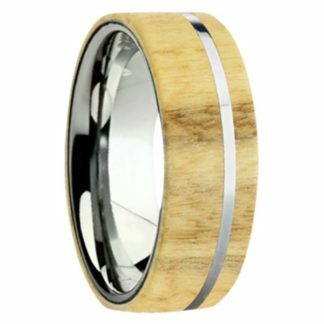 Stunning Tulipwood featuring an 8 mm design in Titanium with eye-catching polished flat design, complete with comfort fit styling. No two rings are the same in that each will have its original living (organic) features – truly a desirable and sought after wood creation. This model is protected with a special patented wood sealer so that it is safe to wear in the water. Rings within this collection are unique in that each is a one-of-a-kind masterpiece, handmade to order. Each ring comes with a Certificate of Exotic Inlay Authenticity. There are no seams in the Exotic Wood Inlay collection – skilled artisans create each one by hand using techniques understood by relatively few craftsmen. PLEASE NOTE: With your purchase of this Exotic Inlay ring, you will receive the S1000 at no extra charge to verify sizing. See details under “Sizing” below. Titanium is the one of the most durable and scratch-resistant contemporary metals on the market – known as aircraft or hi-tech grade titanium – it is hypoallergenic, biocompatible and lighter in weight than tungsten. It originated in the aerospace industry because of its high tolerance to extreme temperatures and has found wide use in jewelry among artisans who love to create stunning designs in this sought-after contemporary metal. Warranty. This model is from our Exotic Inlay Collection and is handmade to order. Each piece carries a one-year warranty covering all manufacturing defects such as cracking, splitting, breaking and discoloring. Availability. This ring is made to order. Please allow 4-5 weeks for creation and shipping. Sizing. 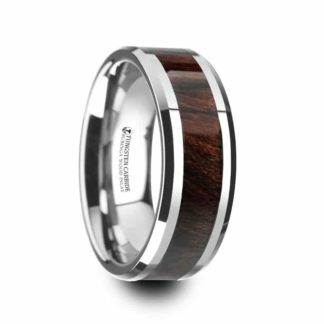 We desire that you receive the exact size that fits your hand, that is why with the purchase of this ring we will first send you a sizing ring (Model #S1000) at no extra charge. 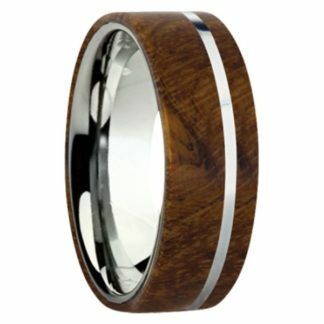 Once you receive the sizing ring, contact us and we will then start production of your custom exotic inlay. This sizing ring is made with genuine tungsten carbide and is yours to keep. We encourage you to wear it when performing those jobs or activities that might damage your custom creation. Sizing rings are available in gray or black tungsten, gray tungsten ships standard. 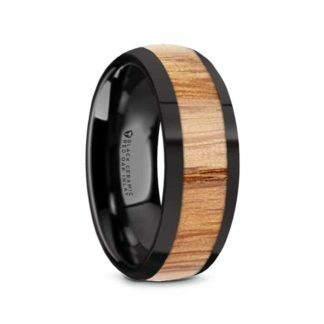 If you prefer a black tungsten sizing ring please reach out to us at sales@simplywoodrings.com or include a note to us in the Order Comments. Engraving. 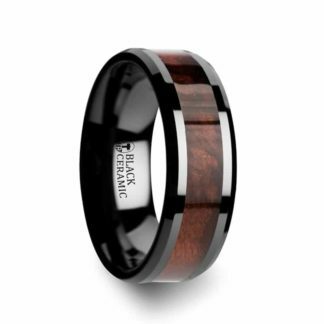 This ring can be engraved on the inside of the ring for that personalized touch. Please limit wording to 26 characters which includes spaces.